PLEASE SEE PRODUCT DESCRIPTION FOR COMPLETE PROGRAM DETAILS. This unit makes the perfect "Silent Salesman" when presenting Jellybean® Accent rugs. Mounted on sturdy locking wheels, our award winning display easily moves throughout your store for maximum exposure. For added impact, place the unit outside next to the entrance of your store and watch shoppers stop to see the colorful rugs. Red Finish - Footprint: 24" X 36" x 68" - with LOCKING WHEELS. 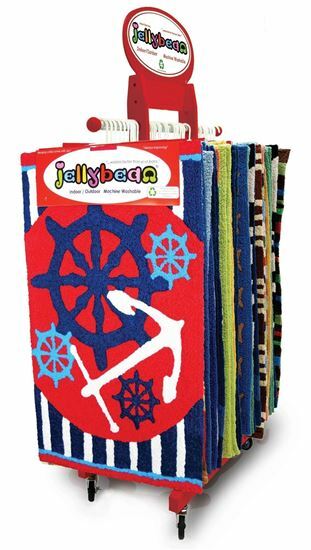 Comes with full color Jellybean® signage PLUS an " I've Been Washed" header card (Washed rugs are not included).